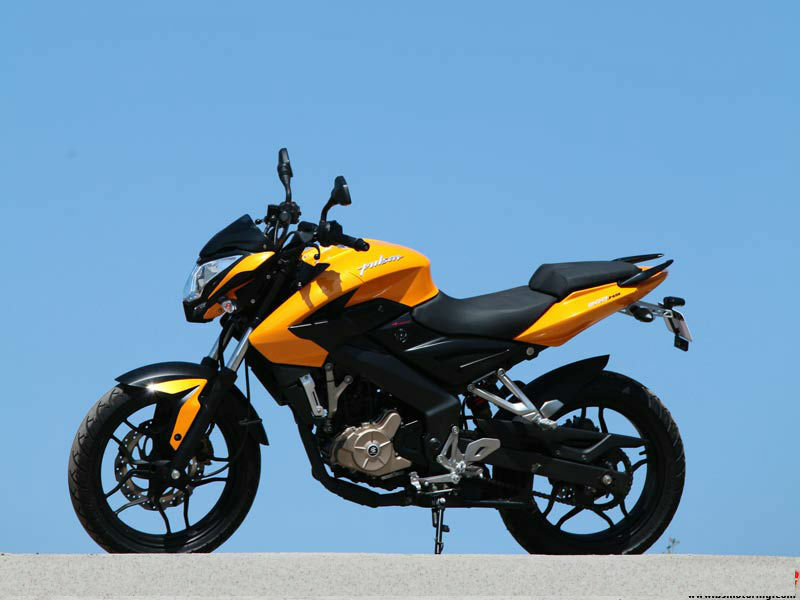 Bajaj Pulsar 200 NS is a sportier and aggressive bike with muscular design, V shaped head lamp assembly and the entire bike assembled over the perimeter frame. Check out the review to get the features, technical specifications & price. 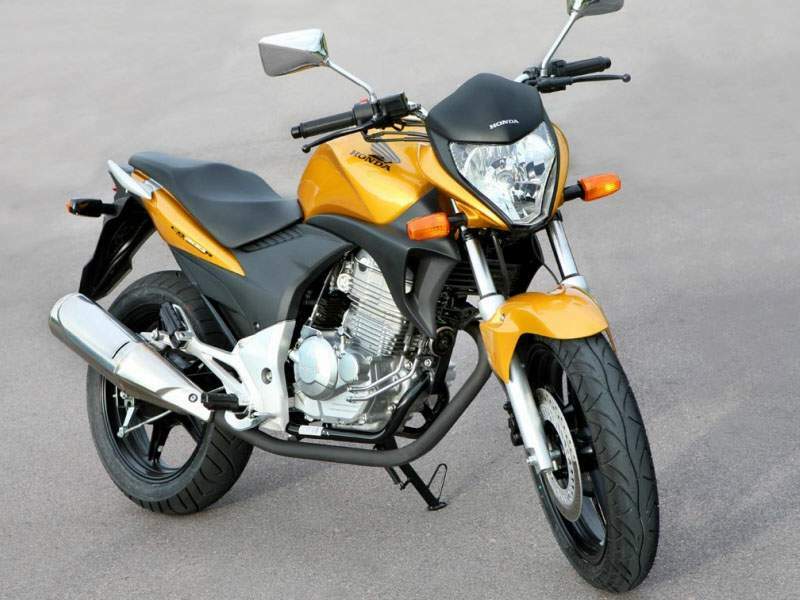 Bajaj Pulsar a brand that left a mark on the Indian automobile market for closely a decade has come back with its upgraded model in 200 cc segment. This time the bike is given a sportier and aggressive look through the muscular design of the tank, the V shaped head lamp assembly and the entire bike assembled over the perimeter frame. Featured with a triple spark engine technology the light weight bike is built in a way to appear hefty at the front and the raised rear seat gives it a dynamic look. The exhaust of this bike is hidden under the belly of the engine. The bike is built with properties to suit the characteristics of sports bike and being free from front cowls gives it a tough street fighter look. 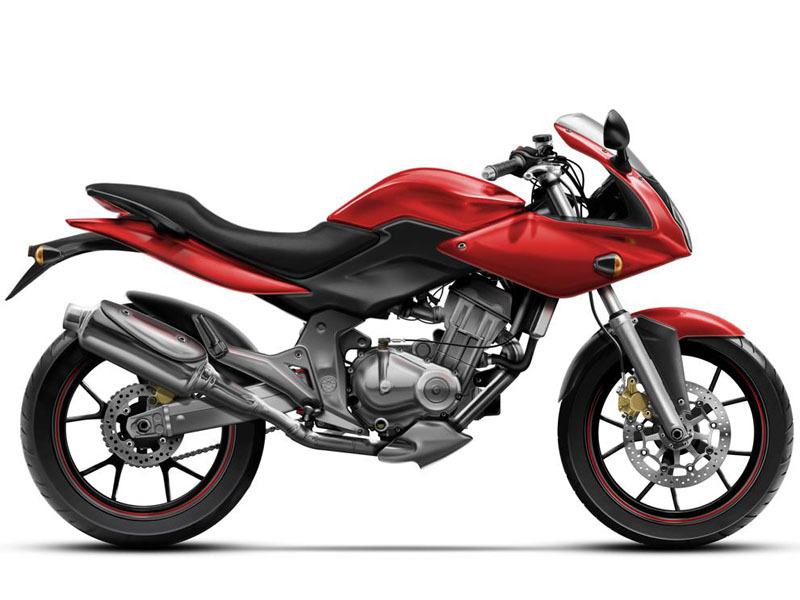 Pulsar 200 NS has come up with a 199.5 cc engine that uses four valves for inlet and exhaust and the valves are driven by Single Over Head Camshaft mechanism. The existence of two valves for inlet and two for exhaust ensures that the engine would deliver output in a better manner at all engine rpms. The liquid cooling system adopted in this engine is responsible for efficient cooling. The radiator for liquid cooling system lies in front of the engine assembly. This engine is mounted with 3 spark plugs for ignition of charge which results in effective ignition and this feature along with liquid cooling would increase the fuel efficiency of the engine. The spark plugs are controlled by an electronic unit which times the ignition on the 3 plugs based on level of charge that enters the engine cylinder. The engine is capable of producing a maximum torque of 18.3 Nm at 8000 rpm. The bike can get good response to acceleration till speeds of range 80 - 100 km/hr. The engine delivers a maximum power of 23.52 bhp at 9000 rpm and this high power delivery coupled with 6 speed gear train results in high top end speeds. The NS in 200 cc model of Pulsar speaks to the sporty properties of the bike which is free from fairings on the front. The bike is built with a bulky tank which has a sharp profile curve which is followed by a fiber cover at the front bottom end of the tank. The side cover is in black and a large part of the rear is side is left open with the swing arm of perimeter frame being visible. The bike is given split seats with the rear seat raised to higher position when compared to front. The black colour combines with a base colour in many areas like front fender, head lamp cover and fuel tank cover. The bike has rear mudguard towards the front of rear wheel (close to monosuspension) and the vehicle number plate and rear indicators are fit on a separate holder. The perimeter frame loaded with thread cut tyres on front and rear give good control of the vehicle while making bent turns in sharp curves. The telescopic fork at front and the nitrous gas filled mono suspension at rear give better riding experience and handling in high speeds and on bumpy roads. The floating caliper disc brakes ensure good heat dissipation and provide an effective braking to get back the bike to stop position within a short distance even when the bike is at high speeds. The large wheel base, high ground clearance and low seat height ensure good handling and comfortable riding experience on long distance travels. The bike is expected to give a mileage of 35 to 45 kms per litre of fuel in normal riding conditions. The bike would cost around Rs 90,000 and this price would change based on the city where it is purchased. The bike is available in red, blue, black and yellow shades.